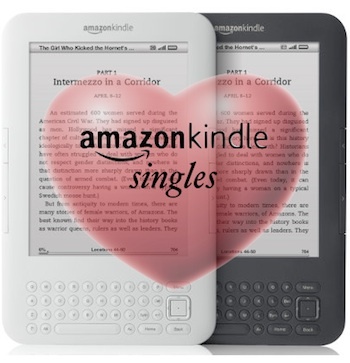 Can you find love on your Kindle with like-minded bookish early adopters? Nope. Amazon’s new service is in fact a misleadingly named new category for long articles and novellas. Amazon today launches Kindle Singles, which lets lonely like-minded digital book readers hook up through Amazon’s global e-book ecosystem. Just kidding. Singles is not a dating service for lonely e-book fans. It’s a (somewhat confusing) attempt by Amazon to inject a whole new level of creativity into the Kindle, but what it’s actually all about is short stories. Singles as in music singles, you see–letting you buy a single song rather than the whole album. Get it? “Less than 10,000 words or more than 50,000: That is the choice writers have generally faced for more than a century–works either had to be short enough for a magazine article or long enough to deliver the ‘heft’ required for book marketing and distribution. But in many cases, 10,000 to 30,000 words (roughly 30 to 90 pages) might be the perfect, natural length to lay out a single killer idea.” That’s how Amazon introduces the concept. Indeed, there is a whole market for intermediate writing that is only really financially viable in the digital book era–and in a world where we may no longer have the attention span for a full novel or nonfiction book. The texts, which Amazon is asking writers to submit, will also be priced “much less than a typical book”–which all but guarantees they’ll sell well if they hit a popular nerve. If Singles take off, the most appropriate comparison may be mobile apps. They are more compact forms of software that cost much less than their counterparts on the desktop–and have been very lucrative for some popular app authors. It’s pretty good timing, too. With the 2010 international short-novel writing event NaNoWriMo just around the corner, short pieces of writing are on a lot of people’s minds. So Singles is definitely a good idea. But a digital book-based dating service? That’s not bad either. How about it, Amazon?